« Well, There’s a Shocker. OK, technically, mitten. 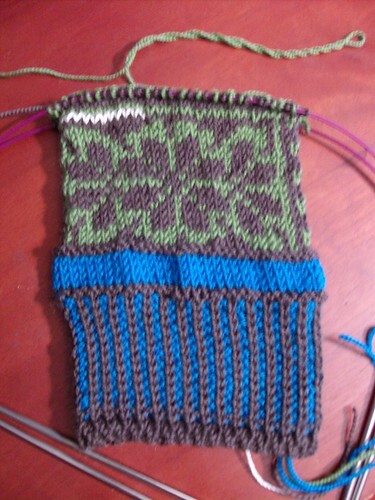 Ok, technically only HALF a mitten. But look how cute! Flowers on the palm side, which will become stripes above the thumb (the white crochet thread is waste yarn for the thumb. I’m using some Cherry Tree Hill Supersock Solids I picked up from DBNY eons ago. The colors are Bark, Turquoise, and Loden. The original pattern calls for a fourth color as the solid stripe between the cuff and the patterning, but I opted to use the Turquoise and keep it at three colors. It’s an easy pattern, and it’s fun! 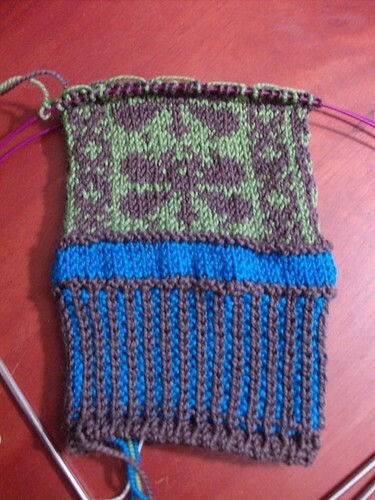 I’m hoping they won’t take me much longer, and then I’ll have fun new dragonfly mittens to wear. 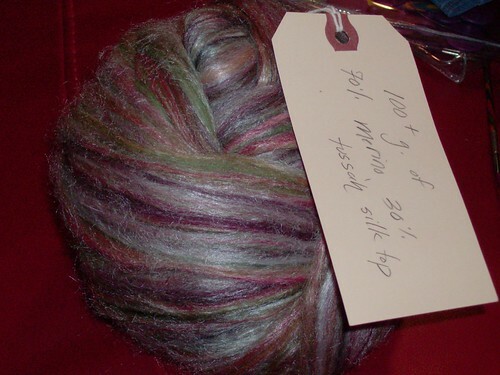 I’m also spinning the next chunk of fiber – some gorgeous merino-silk tussah top that Morgsarah sent me last year when we did a fiber fest swap – I bought for her at MDS&W, she bought for me at Taos. Plus, I’ve got to have something to keep me busy – the author is hard at work finishing up NaNoWriMo! ETA: The mitten is in time out. I finished it up, started the thumb, and tried it on. It’s too small. Dammit. So, I frogged it back to the blue stripe above the cuff (the cuff fits fine) and will be re-starting with US4 needles instead of US5’s. I may also be adding an additional repeat of the pattern so that they are a little bit longer, depending on how much of a gauge difference I get. 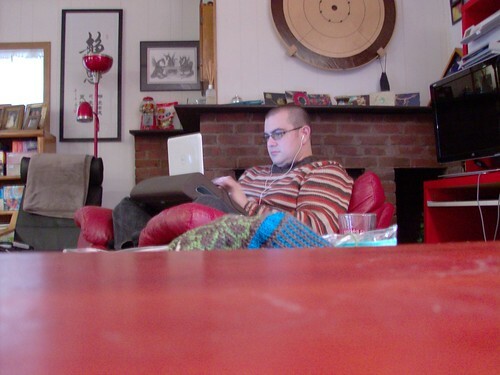 November 28th, 2008 | Tags: Knitting, Spinning, WIPs | Category: Misc. Oh man you’re such a fast knitter. I’m doing some colorwork mittens and they’re taking me forever! Drat! I like the dragonfly motif. I love dragonflies! Isn’t there a sweater with a dragonfly motif at the top? Must search Rav… Don’t get much call for mittens here in the desert, unfortunately. Look forward to see yours finished. Great color choices and it looks like, from here, that you did that tubular cast on, or other such invisible cast on. Nice! The dragonflies are loverly! What patience you must have. I’d be on the hard liquor by row three. Oh, and whenever I see “mittenses”, I hear “filthy Hobbitses!” in my head, and I go all Smeagol for a while. It’s my burden, and I’ll shoulder it. I just needed to share.